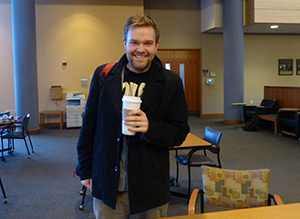 Grab a cup of joe with a Krannert School of Management student during their winter break from Purdue University (December 16, 2013 - January 10, 2014). Current Boilermakers from around the world have volunteered their time to meet you and share their Purdue experiences. Coffee with Krannert is the perfect opportunity for you to meet us and learn more about our programs and life at Purdue. Search avaliable locations below and select what city works best for you. Send an email directly to the Krannert student, you both can work together to schedule a date, time and location for coffee. If you have any questions, please contact the Krannert MBA and Master's Programs Office at krannertmasters@purdue.edu or 877-MBA-KRAN. Los Angeles Area – Alex Serena (serena@purdue.edu). Alex is a first-year MBA student with a specialization in Operations. Los Angeles Area – Eric Barajas (barajae@purdue.edu). Eric is a first-year MBA student with a specialization in Finance. East Bay and San Luis Obispo County – Lauren Young (young211@purdue.edu). Lauren is a second-year MBA student with a Human Resources specialization. Inland Empire and Orange County – Zach Tahiru (ztahiru@purdue.edu). Zach is a first-year MBA student with specializations in Operations and Strategy. South Florida (Miami, Fort Lauderdale, West Palm Beach) – Priyanka Govindraj (pgovindr@purdue.edu). Priyanka is a first-year MBA student with a specialization in Operations. Atlanta – Demetrius Wilson wilso208@purdue.edu. Demetrius is a second-year MBA student. Chicago – Valeria Del Villar (vdelvill@purdue.edu). Valeria is a first-year Master's of Science in Human Resource Management (MSHRM) student. Indianapolis – Demetrius Wilson (wilso208@purdue.edu). Demetrius is a second-year MBA student. West Lafayette – Julia Phillips (japhilli@purdue.edu). Julia is a second-year MBA student with specializations in Operations and Supply Chain. West Lafayette – Brian Fish (fishb@purdue.edu). Brian is a first-year MBA student. Minneapolis - Satish Kunchakuri (skunchak@purdue.edu). Satish is a second-year MBA student. St. Louis – Matt Christopher (christom@purdue.edu). Matt is a first-year MBA. Cincinnati – Brian Fish fishb@purdue.edu. Brian is a first-year MBA student. Cincinnati and Dayton – Jacquelyn Stevens (steve112@purdue.edu). Jacquelyn is a first-year Masters of Science in Human Resource Management (MSHRM) student. Columbia – Sylvester Peoples (speople@purdue.edu). Sylvester is a second-year MBA student with a specialization in Marketing. Cedar City, Salt Lake City, and Davis County – Preston Leavitt (leavitm@purdue.edu). Preston is a first-year MBA student with a Human Resource specialization. Salt Lake City – Peter Jacobson (jacobsop@purdue.edu). Peter is a first-year MBA student. Baltimore and Washington D.C. – Amy Reed (reed126@purdue.edu). Amy is a second-year MBA student. (tentative, contact Daniel to check his schedule) – Daniel Terayanont (dterayan@purdue.edu). Daniel is a first-year MBA student with a specialization in Operations. Bangkok and Chian Rai – Daniel Terayanont (dterayan@purdue.edu). Daniel is a first-year MBA student with a specialization in Operations.